Good deal but check the use by date on butter from Heron's as it tends to be only a couple of weeks, so unless you have a huge household that will get through 2 tubs of butter, the other will end up in the bin. 60% less taste than butter but you can have heat from me as its a good deal!! I got this a few weeks ago and find it melts very quickly if left out for a short while. Don't get that issue with flora or clover. Good deal but check the use by date on butter from Heron's as it tends to …Good deal but check the use by date on butter from Heron's as it tends to be only a couple of weeks, so unless you have a huge household that will get through 2 tubs of butter, the other will end up in the bin. I can't believe it's anything like butter. 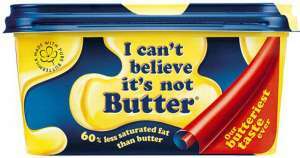 In fact anyone who can't believe it's not butter should be seriously concerned about their loss of taste. If it's not butter what is it? I can't believe it's not better. I have never thought of freezing butter. Quiet a few years ago there was a EEC Butter mountain so large that they gave it away or sold it off very cheaply to low income families. You guessed right - the butter mountain was stored in FO size freezers. These always last way beyond the dates anyway. Noooooo - its not use by - it's "BEST BEFORE" - I've eaten stuff way past this date before and been fine - like 3-4 months past. Don't throw it in the bin - It's a manufacturers ploy to get you to buy more!